Information: Eight days after its encounter with the Earth, the Galileo spacecraft was able to look back and capture this remarkable view about 6.2 million kilometers (3.9 million miles), on December 16, 1992. The picture was constructed from images taken through the violet, red, and 1.0 micron infrared filters. The Moon is in the foreground, moving from left to right. 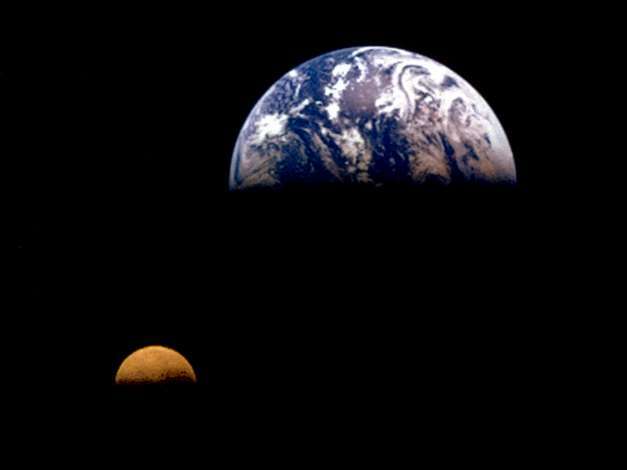 The brightly colored Earth contrasts strongly with the Moon, which reflects only about one-third as much sunlight as Earth. Contrast and color have been computer-enhanced for both objects to improve visibility. Antarctica is visible through clouds (bottom). The Moon's far side is seen; the shadowy indentation in the dawn terminator is the South-Pole/Aitken Basin, one of the largest and oldest lunar impact features, extensively studied from Galileo during the first Earth flyby in December 1990.